Three flight test models were built, and the aircraft became operational in 1994. 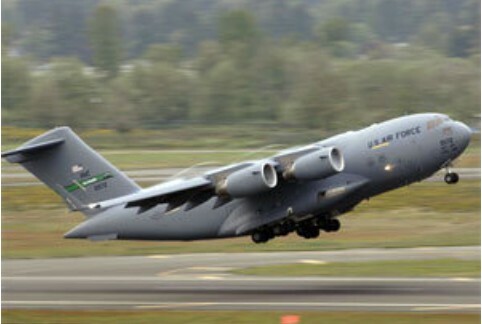 By October 2002 C-17s were being delivered at a rate of 15 per year, with a planned run of 180 aircraft. The C-17 Globemaster is a four-engine transport aircraft fitted with the reversible-thrust F117-PW-100 by Pratt & Whitney, with each of 40,000 pounds of thrust. This powerplant represents the military version of the commercial Pratt & Whitney PW2040 as found on the 757 airliner. 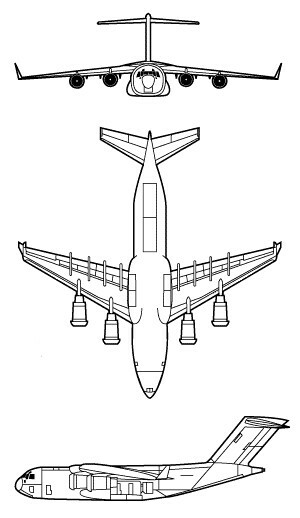 The aircraft is designed for operations utilizing shortened runaways. The C-17 Globemaster III is crewed by a pilot, copilot and a loadmaster. At rear of the aircraft, the C-17 features a large access ramp. The aft-loading ramp allows for transportation and delivery of varying types of cargo including over 100 fully-armed troops and paratroopers, 36 medical litters and nearly 171,000 pounds of cargo. The cargo hold is able to carry most all of the military's air-portable weapon and vehicle systems. With in-flight refueling, the C-17 has a global reach. The Boeing-produced C-17 Globemaster III represents one of the latest additions to the United States Air Force mobile airlift fleet. By 1998, over 140 Globemaster III's were in active or reserve service with the USAF, Air National Guard and the Air Force Reserve. The Royal Australian Air Force had four C-17 Globemaster heavy transport aircraft. Engines: 4 x Pratt & Whitney F117-PW-100 turbofan, 40,440lbs of thrust each.